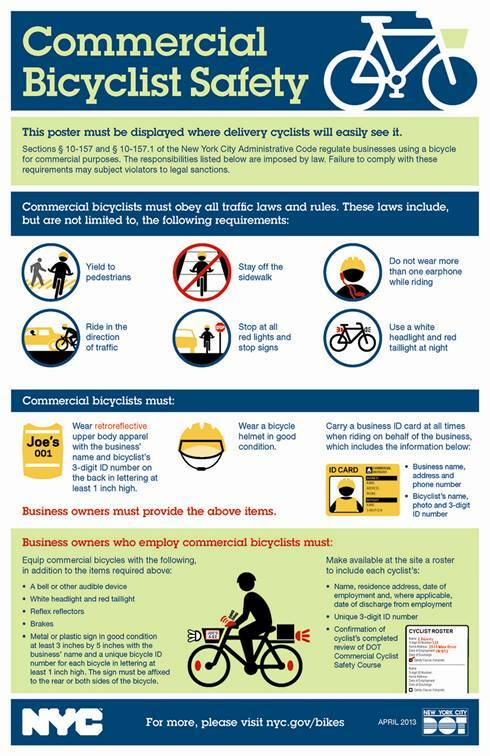 The New York City Department of Transportation (DOT) today announced that enforcement of the updated commercial bicyclist laws, which take effect Tuesday, April 23, will begin next week. The laws were originally passed by the City Council and then signed into law last October by Mayor Michael R. Bloomberg. To enhance safety on streets for all users, DOT launched the nation’s largest comprehensive commercial cycling education and safety campaign. Since last summer, DOT hosted 33 forums citywide, educating businesses and delivery cyclists about the law’s requirements. Nearly 3,500 business and commercial bicyclists attended. As part of this effort, DOT’s Commercial Bicycle Unit conducted door-to-door outreach to more than 4,000 businesses to explain the safety requirements for businesses to provide information and equipment, such as helmets, identifying apparel, bells and lights, and to display on their premises a poster explaining the laws. Commercial bicyclists also are required to complete an online safety course that covers traffic and commercial bicycle laws. Businesses found to be in non-compliance with the law face fines ranging from $100 to $250. NYPD will continue its ongoing enforcement against individual delivery cyclists who ride on the sidewalk or against traffic, who disobey signs and signals or who do not wear a helmet, among other traffic infractions. More information about DOT’s commercial bicyclist outreach and education efforts can be found at www.nyc.gov/dot.